With getting back into the swing of blogging after several months off, I'm happy to say that I get to start up at one of my favorite times of year. I love Fall because of the crisp cold mornings and evenings and all the pumpkin and apple recipes I get to test and create as well as all the slow cooker recipes I'll be making this year too. So along the Fall baking line, I've been trying new pumpkin recipes this week. I am happy to report that I've had great success this week with a couple of new pumpkin recipes and my favorite pumpkin creation to date are these amazing cookies. They blend a few of my favorite flavors with the addition of maple, pumpkin, and oatmeal. So if you love the Fall flavors of baking as much as I do give these cookies a try because I know you'll love them as much as I do. Preheat oven to 375 degrees and line a baking sheet with parchment then set aside. In the bowl of a stand mixer beat the butter and sugars until creamy. Add the eggs, maple, and pumpkin puree and mix until well blended. In a bowl premix the flour, baking powder & soda, salt, & oatmeal. Pour into wet ingredients and mix until it comes together. Add white chocolate chips and mix until incorporated. Using a medium scoop place cookie dough 2 inches apart on a parchment lined baking sheet. Bake for 12 minutes or until golden and fluffy. Oh my these are the best pumpkin cookies out there! These cookies look divine Michelle! I have never made pumpkin cookies. 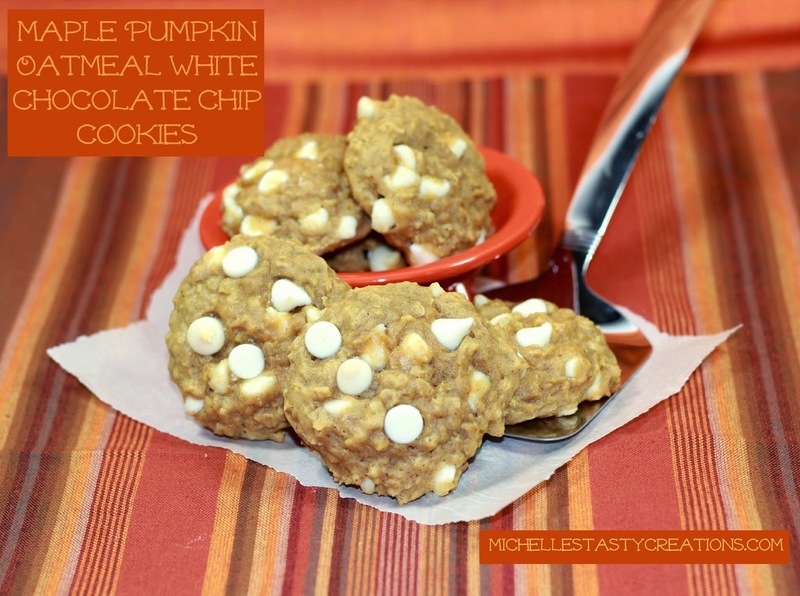 Love the combo of pumpkins, white chocolate and spices. I am pretty sure these taste just as they look!! Thank you so much for the sweet comment. You should definitely give these a try, they are really delicious.